As students trapped inside a sinking ferry off the southwest coast of South Korea waited to be rescued, some with mobile phones messaged friends and loved ones. Eighteen people, including a female crew member, at least five students and two teachers, were confirmed dead by South Korean coast guard officials Thursday night. 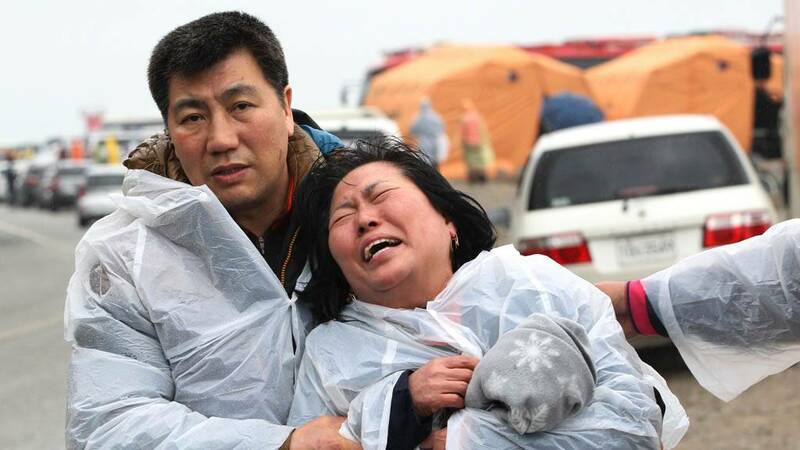 But the toll was expected to jump amid fears that more than 280 missing passengers — many high school students — were dead. Many of the heartrending messages, some of which professed love and appreciation to parents, others asking for forgiveness, were sent while students waited to be rescued. "Dad, don't worry. I've got a life vest on and we're huddled together," one 18-year-old student, identified only by her last name, Shin, texted her father, according to MBC News, a Korean news station. The father replied: "I know the rescue is underway but make your way out if you can." "Dad, I can't walk out," she replied. "The corridor is full of kids, and it's too tilted." The student was among the more than 280 still reported missing. "No phone connection so there is no Internet connection. So just sending text message. There are few people on the ship, can't see a thing, it's totally dark. So there are few men and women, women are screaming,and we are not dead yet, so please send along this message," CNN reported a passenger wrote. "Love you all for real," one high school student texted to 30 members of his theater club, CNN reported. "If I've wronged any of you, forgive me." "Mom," Los Angeles Times reported another student texting his mother. "This might be my last chance to tell you I love you." She messaged back, but did not receive a response. The brother of passenger Wo-ong Gi tried to reassure him that rescuers were on their way, The Telegraph reported.